Raffi Garabedian hails from Berkeley, California, and attended Berkeley High School, where he was a member of their award-winning Jazz Ensemble. As a teenager, Raffi studied with Dayna Stephens, who was one of his first major influencers on saxophone. 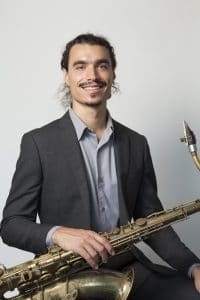 He went on to attend the New School for Jazz and Contemporary Music from 2006-2010, where he received a Bachelors of Fine Arts and studied with such musicians as Bill McHenry, Mark Turner, Chris Cheek, Tony Malaby, and Andrew Cyrille. Raffi has recorded and performed with a variety of artists, including Jorge Rossy, Ben Street, and Dayna Stephens. He helped found the brass band Brass Magic, and plays with the Electric Squeezebox Orchestra in San Francisco. Raffi works as a freelance musician, playing both jazz standards and more experimental music. He teaches regularly at the California Jazz Conservatory and the Stanford Jazz Workshop, as well as offering private lessons.